In July 2007, just over a decade ago, though it doesn’t seem that long, the AMC series “Mad Men” premiered on cable television. Created by Matthew Weiner, the series covered the Madison Avenue advertising culture of the 1950s and 1960s. The title sequence featured a man falling past skyscraper reflections of period advertising images. For a guy like me, this was irresistible. Advertising was cool again! Not just the digital stuff, but real advertising — the kind that built our biggest brands. 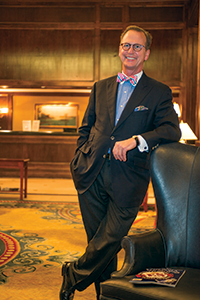 Bowties reappeared — and not just in Richmond! Gray fedoras began showing up on the heads of businessmen everywhere. Lurking beneath the glory of the protagonist’s white maleness, the plot explored a darker theme — the plight of women at work. Long before terms like the “glass ceiling” were coined, career success was limited by predictable rules of gender, race and sexual preference. During the past few months, this hierarchy may possibly have met a deservedly infamous end with revelations of sexual harassment in multiple industries — high tech, entertainment, politics, media and advertising. Few, if any, have been left untouched. Coming out of the shadows, the social media hashtag #MeToo has burned like a torch. Secrets no longer kept, settlements disregarded, inconvenient truths exposed, and names named. For business, this isn’t just about what’s legal. It’s about protecting the goodwill and reputation of the company. Due process is largely the realm of the legal system. Sometimes, companies and the CEOs just need to part ways for the good of the organization. This has happened quite a bit lately. What if “Mad Men” were on television today? That’d be a House of Cards (Kevin Spacey pun intended). Much like the falling man in the show’s opening credits, outdated views of gender roles in the workplace are falling from grace. Much has changed. On the political front, Republicans and Democrats alike have proven so dysfunctional that we now have a self-proclaimed “very stable genius” in the White House. In Virginia, Republicans have lost all three statewide offices for a second four-year cycle. Despite heavily gerrymandered districts, the GOP also very nearly lost a 17-year lock on a majority in the House of Delegates. It’s often said that business and politics don’t mix, and that remains pretty good advice. But quite unexpectedly, being a Democrat is now a thing — even in business. Heretofore, businesspeople generally were assumed to be Republicans. That’s pretty one-note and patently unfair, but it’s been the reality. Businesspeople who are perhaps fiscally conservative but socially liberal have largely just kept quiet. Today, that shoe is on the other foot. Republicans are being rebranded in a way that might just not be good for business. It’s kind of hard to distance yourself from the Trump effect when your party put him in office. Democrats, on the other hand, are for the first time in a long time finding themselves socially acceptable, even in business circles. Until the #MeToo movement, a counter narrative to greed is good went largely unrecognized. Thinking back, you might recall the opening line of “Howl,” Allen Ginsberg’s 1956 poem, “I saw the best minds of my generation destroyed by madness.” Substitute corporation for generation and unfairness for madness, and you have the bitter lament of far too many workers. Today, corporations are being destroyed by unfairness. More than just being marginalized in terms of opportunity, many employees have watched their companies fail at goodness, fail at inclusion and fail to adequately use the skills of many in their own ranks. Welcome to February’s Virginia Business. This is our eighth annual Best Places to Work in Virginia issue. Enjoy!